Carlisle SynTec Systems introduces its RapidLock (RL) Roofing System. This adhesive-free system uses VELCRO Brand Securable Solutions to fully attach 115-mil FleeceBACK RL EPDM or FleeceBACK RL TPO to InsulBase RL or SecurShield HD RL polyiso insulation. 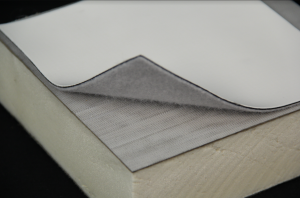 According to the manufacturer, the RapidLock system does away with temperature restrictions, has no VOCs or odors, offers wind uplift ratings comparable to traditional fully adhered single-ply systems and has a Factory Mutual 1-90 approval rating. The adhesive-free system also saves time and labor. Carlisle’s new RapidLock Roofing System was unveiled at the 2018 International Roofing Expo in February 2018, where it won Best Commercial Product in the Expo’s Product Showcase. Judges reviewed new products and selected winners based on a number of criteria including innovation, productivity, and cost-effectiveness. “We’re very excited about this product, seeing that it’s an industry first – a fully adhered system that’s adhesive-less,” said Chad Buhrman, Carlisle’s Insulation Product Manager. “Carlisle’s RapidLock system is a game-changer for contractors. RapidLock installations are quick, quiet, and odor-free, making this system an ideal solution for occupied buildings,” said Austin Kulp, Carlisle’s FleeceBACK Product Manager.